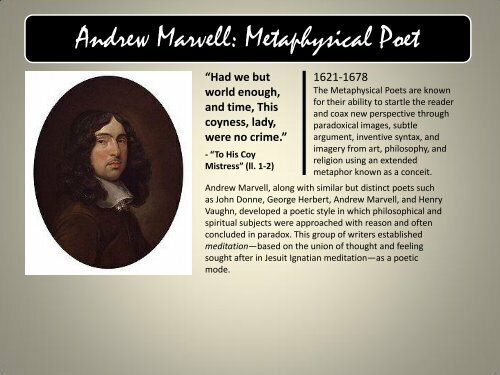 Andrew Marvell: Metaphysical Poet “Had we but world enough, and time, This coyness, lady, were no crime.” - “To His Coy Mistress” (ll. 1-2) 1621-1678 The Metaphysical Poets are known for their ability to startle the reader and coax new perspective through paradoxical images, subtle argument, inventive syntax, and imagery from art, philosophy, and religion using an extended metaphor known as a conceit.  Andrew Marvell, along with similar but distinct poets such as John Donne, George Herbert, Andrew Marvell, and Henry Vaughn, developed a poetic style in which philosophical and spiritual subjects were approached with reason and often concluded in paradox. This group of writers established meditation—based on the union of thought and feeling sought after in Jesuit Ignatian meditation—as a poetic mode.